A survival garden would provide food for you and your family for the term of any disaster. 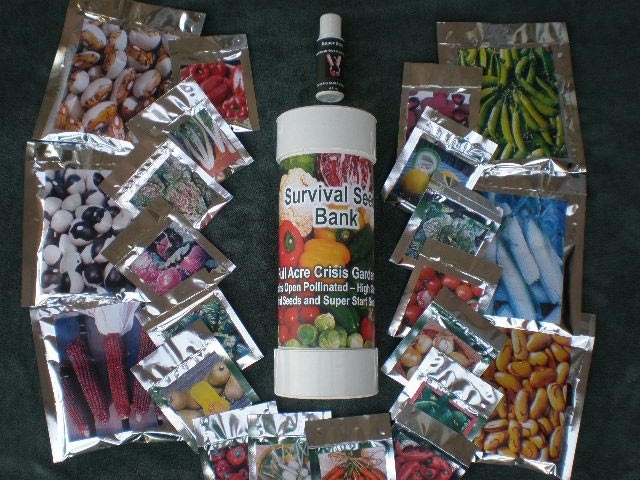 Now you can grow all the survival food you will ever need anywhere in the country with a kit that contains a special seed bank of hard to find, open pollinated… super seeds, grown by small, fiercely independent farmers. Let’s face it. If the stories coming out on the world’s food supply are even half right, we’ve got real problems and they aren’t going to go away quickly. WorldNet Daily cites strong evidence that some government agencies are stockpiling huge amounts of canned food. Jim Randas, former U.S. Intelligence officer, appeared on ABC telling Americans to start stockpiling food. Grocery store prices are rising faster than any time in U.S. history. Worldwide grain stocks are dropping precipitously as bio-fuels consume inventories… and on and on and on. You don’t have to be an Old Testament prophet to see what’s going on all around us. A desperate lower class demanding handouts. A rapidly diminishing middle class.